If people are secured nation will be secured, Said Kiren Rijiju, Union Minister of State for Home Affairs in 25th Conference of DGPs, IGPs. Union Minister of State for Home Affairs Kiren Rijiju today said that the security scenario of the North East has improved tremendously over the period of time. “In the last four and half years, the security situation in North East has improved tremendously. If you see the figures, the casualties, the incidents, it has come down quite heavily. More than 50 per cent incidents of violence, using of our jawans, the casualties on the side of militants reduced, which means, the level of violence has come down. 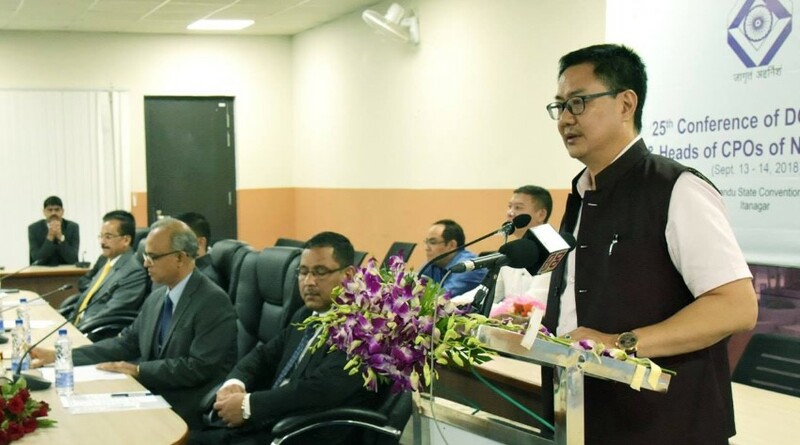 And it is only because of coordinated efforts of our security agencies,” said Rijiju while speaking at the inaugural session of two-day 25th Conference of DGPs, IGPs and heads of Central Police Organisations (CPOs) of North Eastern region at Dorjee Khandu State Convention Center here. While pointing that North East region has 98 per cent international borders, he said the region has to deal with both internal and external problems. Maintaining coordination between the state police and the central agencies, including central armed forces and intelligence agencies, becomes very crucial otherwise in isolation we cannot achieve anything. “No matter whatever efforts we put in, without coordination, without seamless intelligence sharing and active cooperation we will not be able to completely secure our North Eastern part of India,” asserted the MoS for Home. Rijiju said perception about the region over the years requires to be changed. North East India is a complex region and policing here is not the same as compared to other parts of the country. We need to put in extra efforts towards tackling the challenges in the region. He said, looking at the entire scenario of North East, the gathering of North East police chiefs and participation of central forces here in the meeting in Arunachal capital for the second time after 1985, is going to be very path breaking for all of us. Talking about ‘negative’ reporting, connotation about inter-state boundary issues between the NE states and their impact on the people, the MoS said we, all the security forces and State Govt officials at the district level, must be very sensitive in our conduct and we should not incite any individual to vitiate the atmosphere. Inter-state boundary disputes between Assam-Arunachal Pradesh, Assam-Mizoram, Assam-Nagaland, Assam-Meghalaya require tactful handling by the security forces to avoid any untoward incident, he added. “If we are to make North East region as one of the most-sought-after destinations we have to change the situation on the ground. He said besides insurgency, there are several other issues putting a strain on the security and law and order scenario, which demands attention of security forces. “We, at Ministry of Home Affairs, are extending maximum support to security forces in the North East region,” Rijiju said while exhorting them to work in unison towards securing the NE. “Without working together, we cannot achieve anything. That’s why we all must work as a unit,” he added. In his inaugural address, Chief Minister Pema Khandu suggested strengthening the intelligence sharing mechanism among security forces, follow-up actions and coordination between state police forces so that security apparatus is improved. While noting that Arunachal Pradesh was hosting the DGPs, IGPs conference after long 33 years, Khandu further suggested the conference should be held in all NE states on rotation basis so that there is better understanding of the local problems. Khandu further said that North East must be looked as one entity when dealing with security matter. He also said Assam Police has pivotal role to play in security of the region as the state shares borders with almost all the states in North East. He said though Arunachal has no home grown insurgency but the three eastern districts of the state are affected by it. He exuded confidence on the police, para-military forces and army that the matter would be efficiently tackled. Director General of Police S B K Singh and Additional Director of Intelligence Bureau (IB) Tapan Kumar Deka also spoke on the occasion. The two-day conference, being organized by the IB with Arunachal Govt being the co-host, will discuss issues like counter-insurgency, NE security scenario, international borders, underground (UG) movement, ethnicity, inter-state coordination, etc.